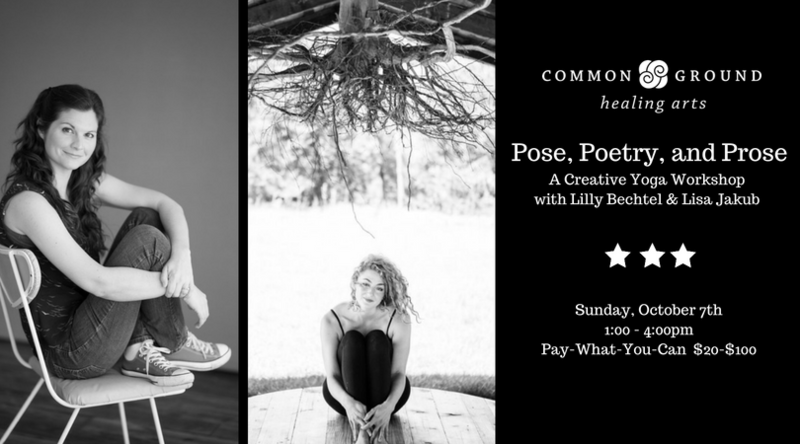 Join Lilly Bechtel and Lisa Jakub for an afternoon of writing and yoga. No matter what kind of writing you do, (or if you simply wish you did more! ), this workshop will discuss ways to move deeper into your writing, access your authentic voice on the page, access an inner stillness that supports any creative project, and deal with writer’s block. Through creative writing prompts, guided yoga, and group discussion, we will consider the practices of writing and yoga and their power to distill our attention, deepen our reverence, and strengthen a sense of agency in our lives. Bring a notebook for writing prompts, and wear comfortable clothes you can move in. Beginners to both writing and yoga are welcome. This workshop is Pay-What-You-Can $20 – $100. The value is $100. Sign up from here. You can pay online for the series in increments of $10 between $20-$100 from here. You are also welcome to pay over the phone at 434-218-7677, or in person at our Jefferson School location when we have other services going on. Please note: No substitutions. Cancellations for this workshop must be made at least 24 hours in advance of the first class; refunds will not be issued after this point. Lilly is a Writer, Musician, and Trauma-Sensitive Yoga Instructor with 12 years of experience offering Yoga and creative writing workshops in Yoga studios, correctional facilities, rehabilitation centers, and veteran’s hospitals. Her writing has appeared in USA Today, The Brooklyn Rail, elephant journal, Public Books, Best Practices for Yoga with Veterans, and The Huffington Post. Lilly is currently pursuing her MFA in Poetry and completing her first record of original music. She performs locally as Lilly Bird. Lisa is an author, Kripalu Yoga teacher, and retired actor who has more than forty film and television credits to her name, includingMrs. Doubtfire and Independence Day. At the age of twenty-two, Lisa retired from her eighteen-year acting career in search of a life that felt more authentic to her. She has found a happier, more purposeful life in Virginia as a writer, teacher, and an advocate for mental health awareness. Her latest book is Not Just Me: Anxiety, Depression, and Learning to Embrace Your Weird.